In recent days the center of discussion on the political scene has been the Obama mandate that all religious entities whether a specific church or a religious organization are required by the government through Obamacare to provide free contraceptive services up to and including the morning after pill and abortion procedures in any health insurance provided by that organization or church if they receive any form of government funding. Many churches and/or religious organizations receive government funding for a variety of reasons but especially for more welfare related services and as such provide a public service through the religious organization or church to those who may be struggling from a financial problem or other related troubles that make it hard for individuals or families to provide for themselves and their loved ones. The mandate through Obamacare for the inclusion of all reproductive services in the entities health care provided or employees as seen by Obama, his administration and those on the left as a necessary element to their premise that government has the authority by law to force its will upon anyone who does not accept the lefts premise that any lack of adherence to this type of mandate is a violation of what they term reproductive services including abortion as a Constitutional right and as such must be mandated by the government to protect a woman's right to chose whatever means they deem necessary for their, "reproductive freedom." This is Obama's and the lefts basic argument. Of course this does not take into account in any way the doctrinal or religious belief of any church or religious organization who receives government funding nor the true meaning of the First Amendment Establishment Clause which states,"Congress shall make no law respecting an establishment of religion or prohibiting the free exercise thereof." It also reveals the fundamental flaw and if you will lie that has been the center piece of the lefts attack on religion for decades that there is a Constitutionally mandated, "separation of church and state." This argument over the mandate for reproductive services to all religious organization has nothing to do with a woman's right to determine what happens with her body or her right for reproductive freedom. Whether this mandate is forced upon religious organizations or not, reproductive services of the type in the mandate are available to all women regardless of their religious affiliation or lack there of through state and county health services and health departments all at greatly reduced prices based upon income even without any type of company provided insurance. So Obama and the lefts premise that without the mandate these services are not available to women who work for a religious entity is an absolute lie. Now to the fact that this is an attack on religion and unconstituional based on the truth intent of what the Establishment Clause means. If a church or religious organization has a belief that any type of reproductive service from contraception to abortion is contrary to their religious belief they have the fundamental protection from the Constitution to freely exercise that belief without fear that the government will interfere with that freedom. Let me also state here for the record that while I have referred to abortion as a reproductive service I do so only for arguments sake since the left believes abortion as a reproductive right. Personally I believe that all abortion is the murder of an innocent baby and in direct violation of our right in this country of ," life, liberty and the pursuit of happiness." The left believes the Establishment Clause to be only a means of separating any form of religious practice or recognition of God from anything related to the state or government. They have completely ignored the true intent of our Founders for placing this most sacred of our rights in the Constitution which was intended to ONLY protect religion from government and not protect government from religion. In other words the Founders wanted government out of any practice of dictating to any religion or individuals religious beliefs what they can or cannot do or how they may practice their religion or not practice religion at all. As such Obama and the left see it within their authority regardless of religious beliefs to mandate upon religious entities their definition of reproductive services and so called freedom since the Establishment Clause as they see it only separates church from state and not protect religion from the tyrannical dictates of government. This attack on religious freedom is as unconstitutional as the premise by the left that all things religious and of God should be separated from anything government or state. The reason our Founders insisted on the Establishment Clause was to prevent the very thing that Obama and the left are trying to pull, using government to force their political agenda of reproductive freedom on religion disregarding religious beliefs and the freedom we have in this country to practice those beliefs as we see fit without fear of government interfering. Again the First Amendment protects religion from government not government from religion through a separation of church ans state. This move by Obama and the left is just another in a long line of attacks where the use of government is tyrannically manipulated in order to force a political agenda on religion and the church to steal the first of our established freedoms as given by God and protected by law through our Constitution the right to freely practice our religious beliefs based upon our individual conscience and not by the dictates of government. #1. You say "churches" and "religious organizations" but under the the Obama rule, religious organizations and churches are *exempt* from covering contraceptives. #2. It should be noted that 28 States already have this law in place, including several states in which the law was passed by a fully Republican legislature. In many of these states, there are NO waivers or exemptions from providing coverage. In that sense, the Obama rule actually *increases* religious liberty for those houses of worship and organizations in states with stricter laws. #3. The nations largest catholic employers already offer this coverage, so this notion that it's somehow an "Obama Unconstitutional Attack On Religion" frankly seems like an opportunistic attack on something relatively inconsequential. #4. When we talk about religious freedom and individual liberty we need to also think of the citizens who are employed by these religiously affiliated institutions: when a Catholic University hires employees from the public, they are hiring people of all faiths and backgrounds. They are hiring Muslims, Jews, Christians, Atheists, Conservatives and Liberals. To say that these employees should be forced to follow the belief system of their employer just because they are hired by that group, seems to me an attack on the *individual's* rights to religious and personal freedom. So we need to keep all these things in mind when we attempt to make arguments like the one you just made. No doubt, people who don't pay attention will be persuaded by what you say - but for those who are informed about the issues, the argument you make has many holes in it. 1. A Catholic institution (hospital, etc.) providing medical services would be mandated to provide insurance covering contraception. IMHO, such an institution is a religious organization. 2. The issue here is the constitutionality of the mandate under the US Constitution. Whether or not some states have a similar mandate is irrelevant. A Federal restriction on religious freedom is far more damaging than one at the State level. If you don't like the situtation in one state, you can move to another. If you want to remain a US resident, you're out of luck if the Feds restrict your freedom. Also, under the Constitution, States have more power and more discretion in many matters than the Federal Government. A Modern American Liberal (MAL) policy is equally destructive whether it is implemented by Republicans or Democrats. There are many MAL Republicans (aka RINO's) who have done as much damage as any other MAL. 3. Your point here is also irrelevant. If some Catholic institutions VOLUNTARILY decide to offer contraception, that's their business. The problem is the Federal Government forcing a religious institution to implement a policy which violates the doctrine of that religion. 4. This point is also irrelevant. A non-Catholic employee (or any employee)working for a Catholic organization should understand the policies of their employer when they are hired. If they don't agree with the organization's policies, they probably shouldn't decide to work there. US Catholic institutions providing medical care or offering medical insurance are bound by the "Ethical and Religious Directives for Catholic Health Care Services". The official position of the US Church is that the Government mandate forces Catholic institutions to violate this doctrine. Any Government mandate requiring Catholic institutions to violate Church doctrine infringes on the free exercise clause of the 1st amendment. 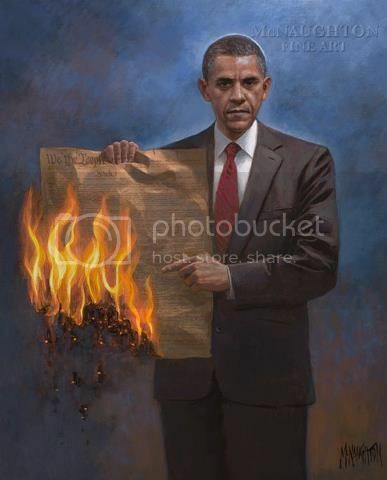 The Obama mandate clearly violates the 1st Amendment.There is no other conclusion you can honestly reach.